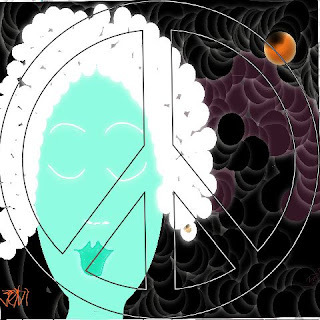 KTR Promotions in Venice Beach & Los Angeles California: Weedend Update is Now! 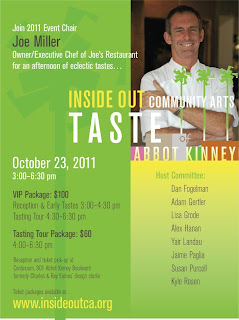 Pick of the Week, this Sunday, Taste of Abbot Kinney! Weedend Update is Now! Pick of the Week, this Sunday, Taste of Abbot Kinney! Lot’s going on this weekend…..and get ready to eat with the Pick of the Week, which is a charity driven event, ‘Inside Out Community Arts' Taste of Abbot Kinney. 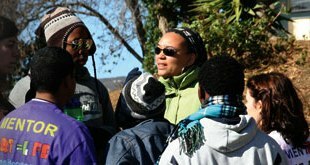 If you don't know about Inside Out Community Arts, it is a wonderful organization that helps kids. After school arts programs and support are offered. Middle school and high school teens have a place to call home. It's a great organization. 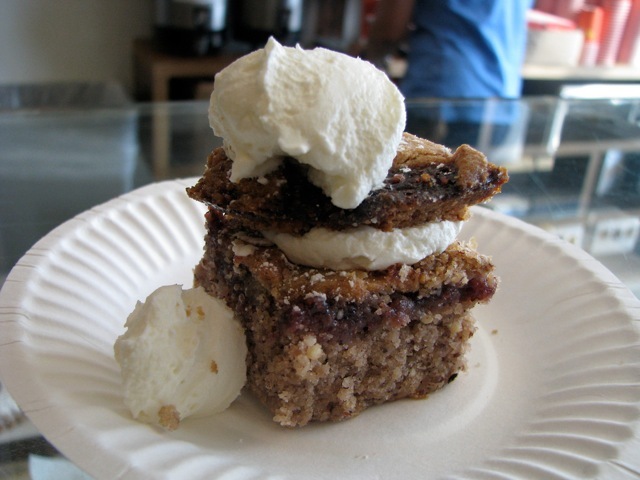 So treat yourself, and enjoy a delicious and tasty Sunday while helping out a good cause. Cecilia Najar, a former food writer started the event three years ago as a fundraiser for Inside Out Community Arts. Cecilia always loved what this organization stood for and how it helped out so many kids. Now Inside Out Community Arts produces the event itself. After the event production costs, all proceeds go to Inside Out Community Arts. 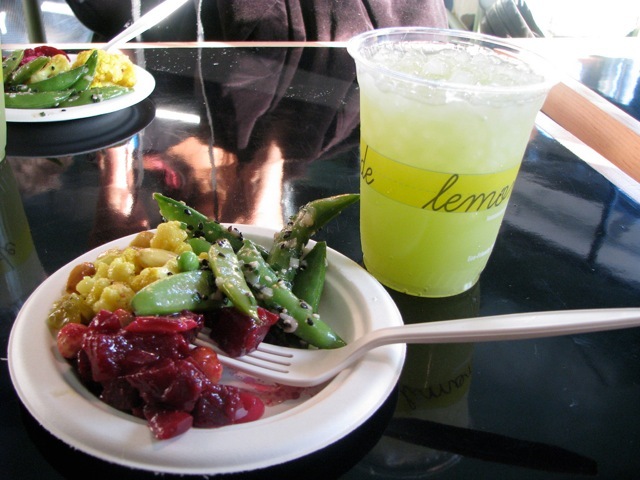 This year's Taste of Abbot Kinney has worked out the kinks. Yes there was a bit of a situation last year, when they ran out of food...BUT they have brought in the big guns to run the show this year. 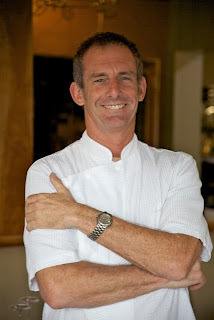 The fearless leader and 2011 event chair is Joe Miller, chef and owner of Joe's restaurant. Adam Gertler (below left) is the event reception host, from the Food Network. Taste of Abbot Kinney includes a VIP Tasting Package (3:00 – 6:30 pm), and a Tasting Tour Package (4:00 - 6:30 pm). The event will include a DJ, live music, exclusive tastes, cocktails and demonstrations from some of the street’s Executive Chefs including Joe Miller and Yoshi Shima. 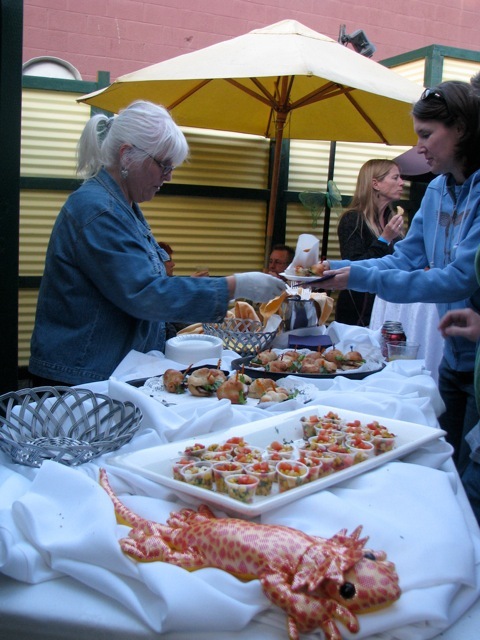 Participating restaurants include: Gjelina, Hal’s Restaurant & Bar, Joe’s Restaurant, Lilly’s Frenc Café & Bar, Shima Sushi, Primitivo, Casa Linda and Lemonade. The opportunity drawing includes hotel and rstaurant packages from such destinations as: Loews Santa Monica Beach Hotel, Hotel Wilshire, Hotel Erwin and Terranea Resort and original art by Ellie Riley. Taste of Abbot Kinney’s event venue is 901 Abbot Kinney Boulevard, courtesy of Continuum. This venue was formerly the legendary design studio for Charles & Ray Eames. See below under Sunday Events for more details. Don’t forget….Music tonight at several local restaurants…see the Restaurant/Bar Page for specials too! In Santa Monica stop by Duncan Miller Gallery, who offers an opening reception for their latest exhibition of Marilyn Monroe photographs. In addition to the "12 Photographs" large-format portfolio from Lawrence Schiller, this show contains a tightly-edited selection of iconic prints from known photographers who captured Marilyn, *including Philippe Halsman, Milton Greene, Bob Willoughby, Murray Garrett, Benn Mitchell and others. 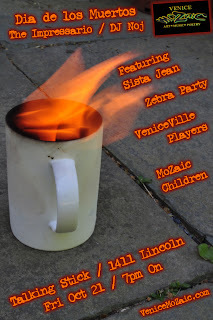 Close by, Venice MoZaic is hosting their monthly Celebration of Art, Music, and Poetry at The Talking Stick Coffee Lounge. Hosted by Nickie Black, DJ Noj will be spinning as well as Zebra Party, MoZaic Childen, VeniceVille and special guest Sista Jean. Others include Maryam, Substance, Ordell Cordova, and JNae will also be featured. 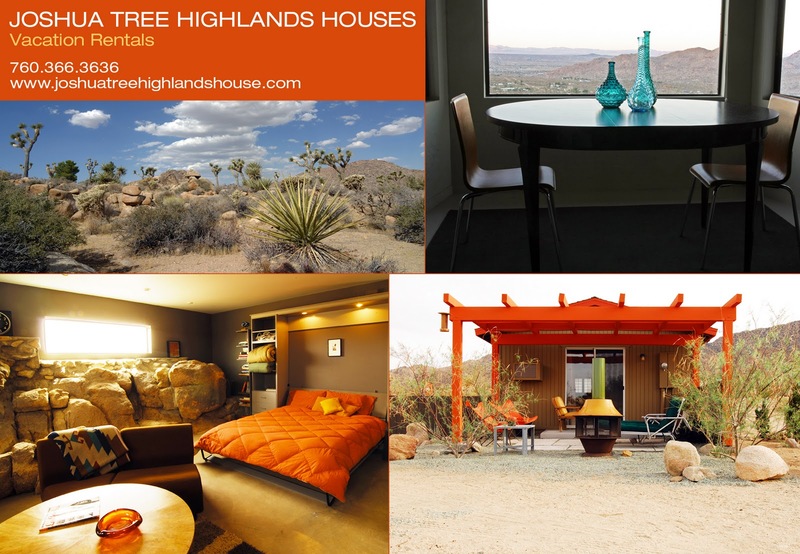 Or plan a trip this weekend to Joshua Tree…and enjoy an art walk in Joshua Tree, the HWY 62 Art Tours. Check out this lovely Joshua Tree Vacation rental. Just say you heard about it on KTR Promo and that you would like to attend the art exhibiton and you get a 10% discount…Yeah! Fullerton anyone? Say what? Yes, I’m going, cause I love this artist. Thought I would put it up, you never know who’s checking the site. If you are in the area, you won't want to miss this special lecture happening today. Artist, Jim Dahl will be be speaking from 2 00pm till 4:00 pm as well as showing 10 new paintings of chairs and childhood past. Refreshments will be served. 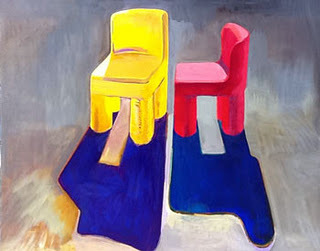 This exhibition, entitled Primary Chairs is currently on display at the New Community Café at the Fullerton Public Library. Jim Dahl is a wonderful artist. Today is the day to get out of LA….go ahead, take a trip to Joshua Tree and enjoy some nature, art and music. 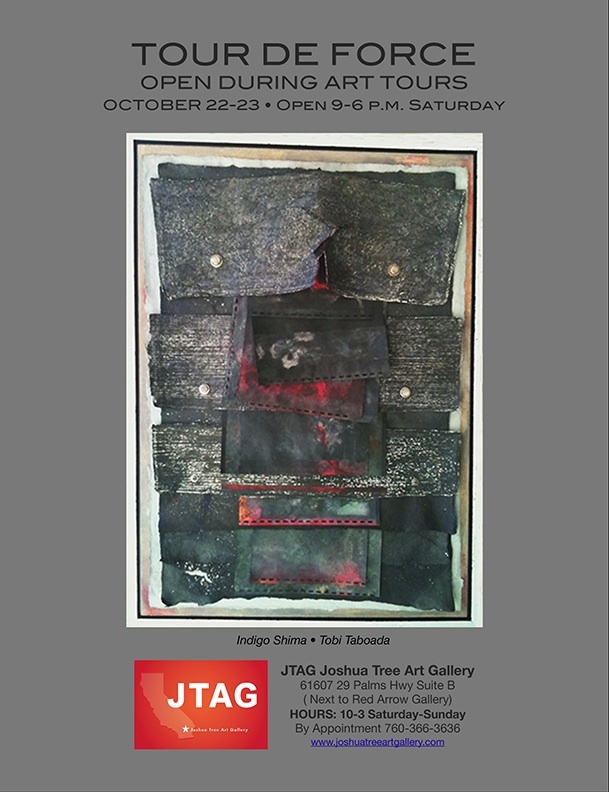 Stop into Joshua Tree Gallery, who will be having am artist reception for Tour De Force and to celebrate HWY 62 Art Tours in conjunction with the Morongo Basin Cultral Arts Council. 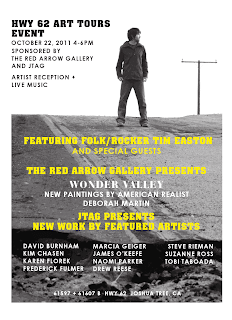 The Red Arrow Gallery and JTAG 61597 + 61607 B HWY62, Joshua Tree, CA 92252 will be offering a fun event from 4:00 pm till 6:00 pm. JTAG & Red Arrow Gallery will host a live concert by Tim East and guests. JTAG’s exhibition, Tour De Force will feature artists, David Burnham, Kim Chasen, Karen Florek, Frederick Fulmer, Marcia Geiger, James O'Keefe, Naomi Parker, Drew Reese, Steve Rieman, Suzanne Ross and Tobi Taboada. 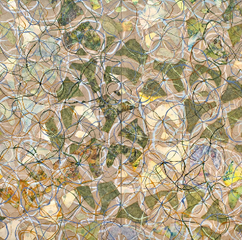 Red Arrow Gallery presents new paintings by Deborah Martin. 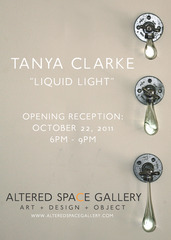 Altered Space Gallery presents new work from Tanya Clarke’s ‘Liquid Light’ series. This artist is wonderful, I’ve seen her work. She uses reclaimed plumbing and low-voltage lights to breathe life into hand sculpted solid glass drops Opening runs from 6:00 pm to 9:00 pm. 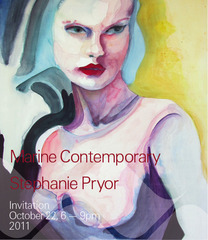 Also in Venice, from 6:00 pm till 9:00 pm Marine Contemporary features artist, Stephanie Pryor. 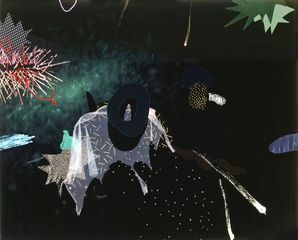 There’s always Bergamot Station….located at 2525 Michigan Ave.
Next go to Craig Krull Gallery (B-3), and enjoy the opening reception for Peter Alexander from 5:00 pm -7:00 pm. 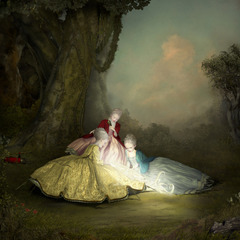 Craig Krull Gallery is participating in the Pacific Standard Time (an initiative of the Getty). 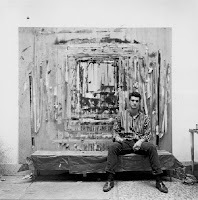 310.828.6410; http://www.craigkrullgallery.com. Another Pacific Standard Time show ….Larry Bell will be featured at The Frank Lloyd Gallery (B5B). Another…at the Schomburg Gallery, who is having a reception for Fred Lisaius and Margaret Francis. 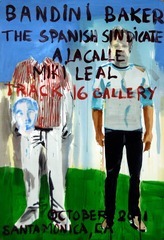 Track 16 (C-1) offers a group show featuring artists, Abraham Lacalle, Miki Leal Baldini Baker as part of the Spanish Syndicate exhibition. 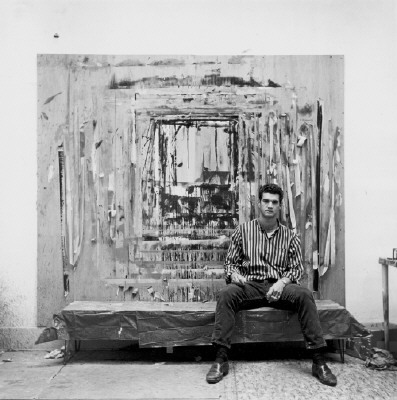 The Robert Berman Gallery has some incredible Pacific Standard Time exhibitions on view, so b sure to take a look, if you have not yet seen them. Transformation (D-5) just opened see image, Robert Heinecken…pop in and enjoy as well as Paid to Play at (C-2 ). 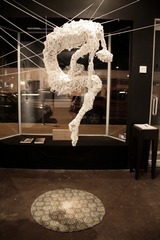 Gallery 9 has a new location, 3830 Main Street. 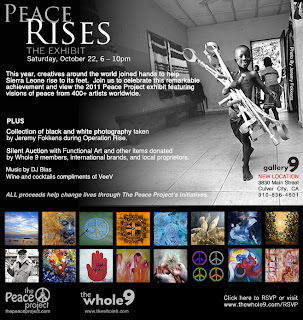 Tonight’s event, the 2nd annual Peace Project exhibit, Peace Rises will premiere in their new space! This year, artists from around the world joined hands with The Peace Project to help the country of Sierra Leone rise to its feet. 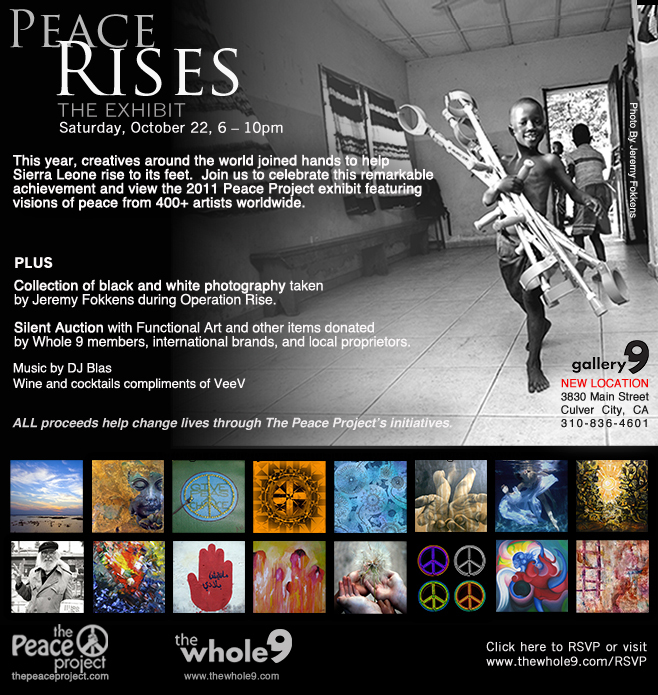 Celebrate this remarkable achievement and to view this year’s Peace Project exhibit featuring visions of peace from over 400 artists worldwide. A collection of black and white photographs by Jeremy Fokkens taken during Operation Rise will be on display. Silent Auction with Functional Art donated by Whole 9 members and items donated by international brands and local proprietors. Blue Five Art Space presents artist, Argishti Musakhanyan. This event runs from 6:00 pm to 10:00 pm. 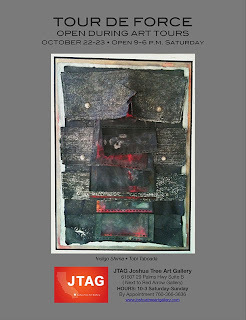 The opening reception will run from 7:00 pm till 10:00 pm. In case you have never been, they always offer snacks and a nice bar too. Corey Helford Gallery is located at 8522 Washington Blvd., in Culver City 90232; www.coreyhelfordgallery.com. Come on out and support a fabulous non profit, Inside Out Community Arts. Don’t be shy cause, this year's Taste of Abbot Kinney has worked out the kinks. Yes there was a bit of a situation last year, when they ran out of food...BUT they have brought in the big guns to run the show this year. The fearless leader and 2011 event chair is Joe Miller, chef and owner of Joe's restaurant. 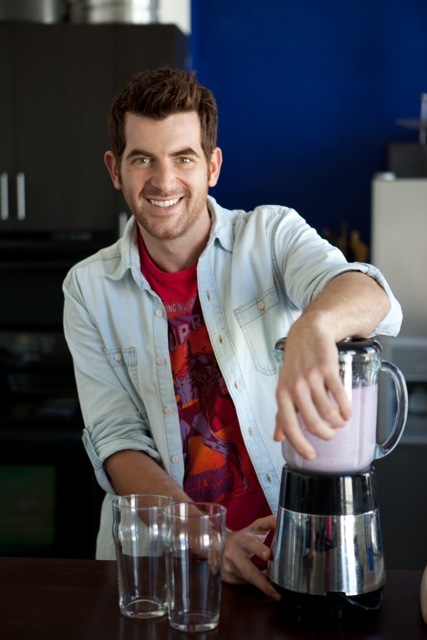 Adam Gertler is the event reception host, from the Food Network. Participating restaurants include: Gjelina, Hal’s Restaurant & Bar, Joe’s Restaurant, Lilly’s French Café & Bar, Shima Sushi, Primitivo, Casa Linda and Lemonade. The opportunity drawing includes hotel and restaurant packages from such destinations as: Loews Santa Monica Beach Hotel, Hotel Wilshire, Hotel Erwin and Terranea Resort and original art by Ellie Riley. This year's silent auction will feature hotel packages at Hotel Erwin, Hotel Wilshire, Loews Santa Monica Beach Hotel. A recent addition is a prestigious collection of original artworks by twentieth century masters, Picasso, Chagall, Matisse, Miro, Renoir, Dali, and more donated by the Andrew Weiss Gallery. All guests are also invited to participate in the Opportunity Drawing which will feature special items from Abbot Kinney merchants, tickets to LACMA’s “California Design” exhibit, and packages at local restaurants including James Beach, Gjelina and Terranea Resort. Taste of Abbot Kinney’s event venue is 901 Abbot Kinney Boulevard, courtesy of Continuum. 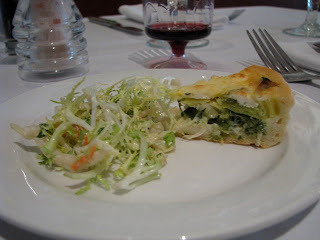 Enjoy the weekend…and I’ll see you at the art walks and maybe on Abbot Kinney too, Bon Appetit!